Ride like a Rock star. The only Ann Arbor Limo Company you'll ever need. Rockstarz Limousine & Party Bus is committed to being the only limousine company you will ever need. Whether you’re a new or former client, our Ann Arbor party bus service provides you with comfortable, clean and on-time service. Our party buses are professionally cleaned and maintained by certified technicians. All of our Ann Arbor Limos are also fully licensed and insured. Every party bus in Ann Arbor is MDOT-approved and we carry paperwork to show this on every Limousine and Party Bus we have in our fleet. Here at Rockstarz, we make it our job so that our customers will keep coming back to make more memories. Our fleet of Ann Arbor Limos offers a variety of packages for custom transportation. Ann Arbor wedding limo packages will include a complimentary bottle of champagne, rolled out red carpet treatment, cups, napkins and ice in our elegant mobile mini bars. This is the best wedding limo package in Ann Arbor. We also offer wine tours in Ann Arbor. Our Ann Arbor wine tour party bus include 6 hours of transportation service, 3 different wineries of your groups choice, as well as cups, napkins and ice for all the beverages you decide to bring aboard. 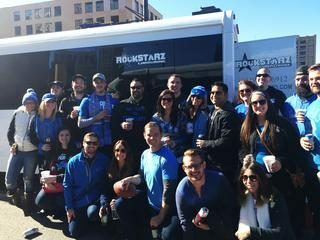 How about taking an Ann Arbor Party Bus to one of our local professional sporting events? We offer the cheapest limos in Ann Arbor. To receive a free limo price please call us at (734) 786-2600. When you want the Best Ann Arbor Limo Service, airport service, taxi service, party bus rental or any other type of transportation call us. Don’t make the mistake of looking for the cheapest limo price, be sure to go and look at the vehicle you will be getting for your event. At Ann Arbor party bus we earn your continued business by offering the most competitive rates today. From the moment you call Ann Arbor Limos to the moment we drop you off at your final destination Ann Arbor Limos will show you why we are the best limo company in the Ann Arbor area. Ann Arbor Party Bus has perfected the art of customizing transportation to any individuals needs. At Ann Arbor party bus transportation we will make our business relationship grow stronger and prove to you there is no other limousine service that compares to us. Ann Arbor limos has the most up to date fleet on the limo market today. We set the standard in customer satisfaction promoting the highest quality customer service. Imagine going to any event that your friends and family would enjoy. Now think about how hard it is to park, get to and from without drinking and driving. Especially with the strict laws that apply today for DUI’s. Now imagine everyone on one of the best Ann Arbor party bus drinking, dancing, and being dropped off at the front door and catered to like a celebrity. Which one sounds more convenient? Which one sounds the safest? All it takes is a little organization and you can be sure with one of Ann Arbor limousines professional drivers will get everyone back to the final drop off in a safe , fun manner. Let Ann Arbor Party Bus take all the hassle out of finding something to do on a night out. With our page of reviews on what to do in and around surrounding cities you can easily create an experience of your own! Ann Arbor Limos caters to the following special occasions. Night on the town Limo, wedding anniversary party bus, birthday limousine, prom party bus, bar mitzvah limo, bat mitzvah limo, wedding party bus or wedding limos, sporting events party bus, concert party bus, casino limo trip and much much more. Reserve your Limo or Party Bus in Ann Arbor Today! Ann Arbor Limo Transportation will be the only company you ever use once you book one of our fine fleet of vehicles. Ann Arbor limo rental will guarantee a safe and exciting experience. Offering the Best Ann Arbor party bus service in the area is our goal. Our Ann Arbor Limousine customer agents would be honored to answer any specific limo or party bus questions you may have. Let us heed the burden of getting you to your destination safe and on time, while you enjoy one of our exquisite limo party buses making a memory in time. We are open seven days a week call us at 734-386-6912 and follow us on our social accounts.